The Washington Office on Latin America (WOLA) and Duke University have named Chad Broughton’s book, Boom, Bust, Exodus: The Rust Belt, the Maquilas, and a Tale of Two Cities (Oxford University Press, 2016) as the winner of the 2016 WOLA-Duke Human Rights Book Award. Broughton will be at Duke University on March 23, 2017 to accept the award. 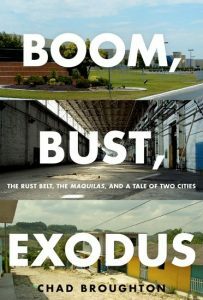 Boom, Bust, Exodus traces the ripple effects of a single factory closing in Galesburg, Illinois, and its reopening in Reynosa, Tamaulipas, a border city in Mexico. 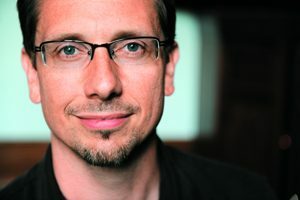 Broughton uses a transnational and longitudinal approach to tell a human and humane story of the NAFTA era from the point of view of those most caught up in its dislocation – former industrial workers and their families in the Rust Belt; assemblers and activists in the borderland maquiladoras; and migrant laborers from the Mexican countryside. First awarded in 2008, the WOLA-Duke Human Rights Book Award honors the best current, fiction and non-fiction book published in English on human rights, democracy, and social justice in contemporary Latin America. The books are evaluated by a panel of expert judges drawn from academia, journalism, and public policy circles.